Dogs are capable of grieving over a lost loved one, very much like humans do. 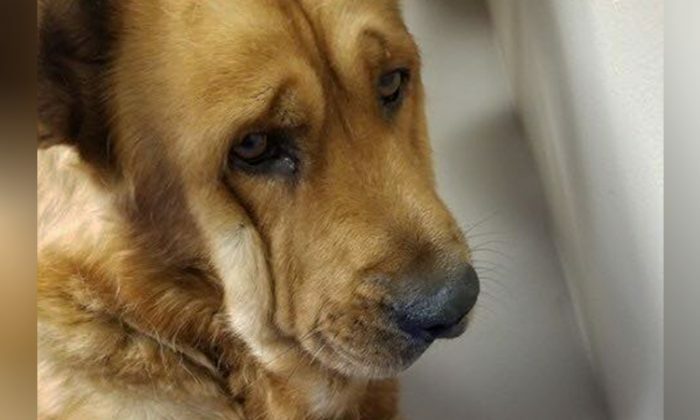 A golden retriever was dubbed “Detroit’s saddest dog” when pictures of his woeful face surfaced online not long after his owner’s death. The life of Rio, a then-10-year-old golden retriever mix, was completely turned upside down following his owner’s demise. Suddenly, he was alone after living in a loving home for 10 years. With no one to take care of him, Rio was taken to Detroit Animal Care and Control. Not long after Rio arrived at the shelter, the workers noticed there was something amiss with the dog. Living in an unfamiliar place filled with strangers, Rio was visibly depressed and shutting down. He wouldn’t eat. He wouldn’t interact with the shelter workers, nor would he look at them in the eye. He quietly sat in the corner, facing the wall with a woebegone expression. He hung his head low, as if mourning the death of his owner. Obviously, Rio was having a hard time adjusting to life without his owner. So, the shelter workers contacted Detroit Dog Rescue (DDR) for help. However, Rio still showed no signs of improvement at Detroit Dog Rescue Center. “He wanted nothing to do with the world,” Kristina Millman-Rinaldi, executive director of DDR, told MLive. What should the rescue workers do to help Rio deal with his pain? “A lot of people don’t realize what intuitive and sensitive creatures dogs are. They sense, like humans, everything that’s happening around them,” Millman-Rinaldi told The Dodo. Millman-Rinaldi realized the solution was to find Rio another loving foster home. Fortunately, DDR soon found a foster home for Rio. DDR’s field volunteers, Ryan Callahan and his wife, Tashia, were willing to help the sad dog pull through this tough period in his life despite owning two family dogs and caring for another foster dog. “He needed us, and we were able to provide the one-on-one time he needed,” Callahan said. Callahan and his wife brought Rio back to their home one snowy night before Valentine’s Day. To make Rio feel warm and comfortable, the couple set up a special room for the dog in Callahan’s home office. And sure enough, with tender loving care, Rio slowly cheered up. The dog began lying down by Callahan’s feet in the home office. Then, he started sitting on Callahan’s lap. Rio even leaned into Callahan for a small hug in a photo shared by DDR, a heartwarming moment. Hopefully, Rio will soon let go of his grief and find another forever home, where he can spend his golden years. “My hopes are that he finds his place, finds his purpose again, and we’re going to help put him back together,” Millman-Rinaldi said. And Millman-Rinaldi has one piece of advice for pet owners. “No matter how old you are, leave plans for your pets,” she said.